The internet has become such a pervasive element in society – and in our lives – that it was inevitable that grief should find its way online. The Yahoo group my high school classmates started after 9/11 is still going strong, though its purpose has changed. My friend, Joe, started a Facebook group to keep friends up to date on the health of his partner, Dennis, who died a few months ago. There are Twitter accounts that exist to inform the world about deaths of celebrities. 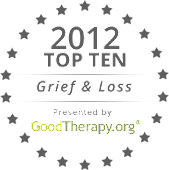 Blogs and websites are devoted to grief support. Is civilization better off with these resources? As much as I’m tempted to say “no”, I have to say yes. The ability of the internet to connect people not just with each other, but with resources, is staggering. People who may not be comfortable expressing their grief in a traditional grief support group can find websites that allow them to do so in a less public way. Less public? Definitely, because even though nothing’s truly private on the internet, grieving online means never having to face people. Not everyone’s ready or comfortable doing that. In the coming days, a new page will pop up here: “Resources”. It will list books, films, TV shows, websites and organizations that relate to the experience of grieving the death of a friend. All websites and organizations will be vetted by me, so you can be assured that they are legitimate and helpful. Others will be introduced here in the coming months. Obviously, some are online resources, some are “IRL” – “in real life”. In the long run, the source is not important. What matters is that you find the support and solace you deserve. With friends being spread all over the world, social media sites have become a god place to keep up with their lives and the deaths. I haven't heard of any friends passing via this vehicle though. Good luck with your site. It is informative and helpful.